(4-pole switch MAY*also work for Sansui 7070, 8080, 9090 DB receiver Audio Mute Switch) Replacement for most Pioneer ASG-212, ASG-213, ASG-313, ASG-214, ASG-316 and others. rate after a few years. If yours is not broken yet, it will fail and probably soon. when we purchased the unit we know it will either fail on us in restoration or on the buyer of the unit. 12-Pin (4-pole, 6 pins per side) and 18-pin (6-pole, 9 pins per side) switches. 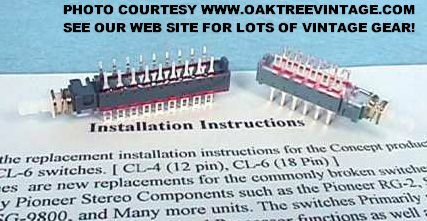 They are a simple install for most electronic techs. Includes basic instructions. 12-Pin (4-pole, 6 pins per side) - $19.99 ea. 18-pin (6-pole, 9 pins per side) - $19.99 ea. regardless of quantity of switches ordered. for up to 6 switches. If you have one of yours bad you should replace the other(s) now also. Any repair / restoration should be undertaken ONLY by a QUALIFIED ELECTRONICS TECHNICIAN!